Becoming a successful and effective business analyst is now easy with the presence of the business analyst certification program offered by Brainmeasures. The Brainmeasures business analyst course is developed in such a way that it validates the knowledge of its participants on the most crucial analytical concepts, skills and expertise essential in performing their roles and responsibilities as business analysts. 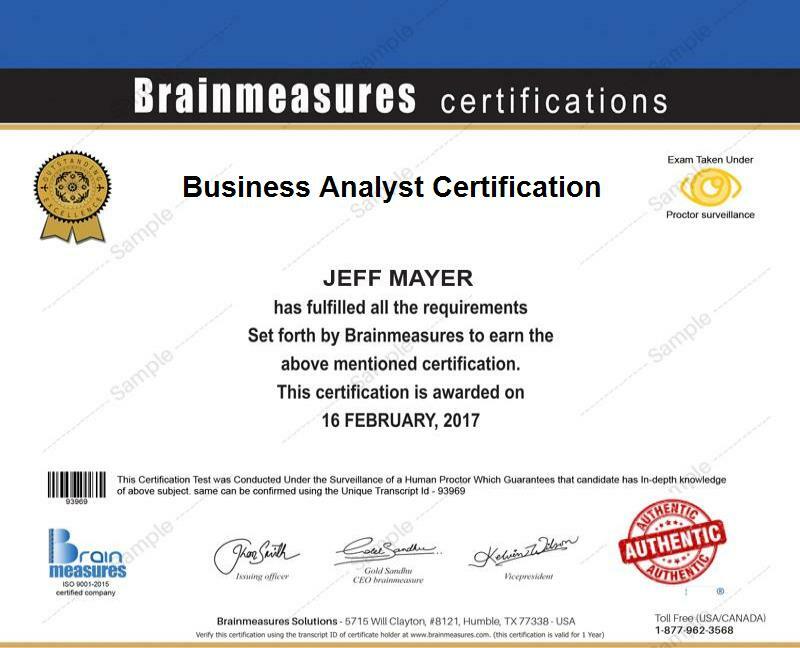 Here at Brainmeasures, you have a hundred percent guarantee that you will receive a certificate which independently and expertly verifies your highly remarkable business analysis knowledge and skills. With the help of the business analyst online certification course from Brainmeasures, you get the chance to obtain a clearer background about the field, thereby allowing you to recognize the complexities and breadth of knowledge needed to become successful in the business analysis industry. The highly comprehensive business analyst training which you can get from the program works in creating greater awareness about the entire business analysis process by clearly defining the roles, value and advantages of the profession and making the most out of the process to help improve the performance of a business organization and allowing it to obtain a more competitive edge despite the fierce competition in the market. The business analyst certificate which you can get after completing the certification course is an indication that you have a high level of knowledge and skills regarding the field. The business analyst certification program which is now available at Brainmeasures is a huge help for individuals and professionals who are still new in the field of business analysis and who want to generate the knowledge and skills needed to get a job and increase potential for higher earnings. It is also ideal for professionals who are tasked in identifying business requirements useful in driving success to projects related to IT as well as those whose responsibilities involve identifying, analyzing, designing and developing processes that work in improving the flow and performance of a business organization. Business analyst certification holders are said to be among those professionals who receive a more stable flow of income. If you are already a certified business analyst, then it should be noted that the actual salary that you will receive will be fully dependent upon your level of seniority and if you have any specialization like project or business systems management. At present, business analyst certification holders earn a regular salary of around $41,000 to $86,000 annually with annual bonuses that range from $202 to $9,000.